It’s tough chasing a career or even contributing to the household income when faced with the challenges of relocating every few years, managing the household during deployments, and constantly reinventing yourself professionally. Adapting to new environments and being flexible with your skill sets is a must. The likelihood of moving into the same position (or even the same industry) in a new town can be pretty slim. No, this isn’t a drop-down menu for a job search engine — it’s excerpts from my actual work history! I’d wager most military spouses have a similar eclectic resumes, too. 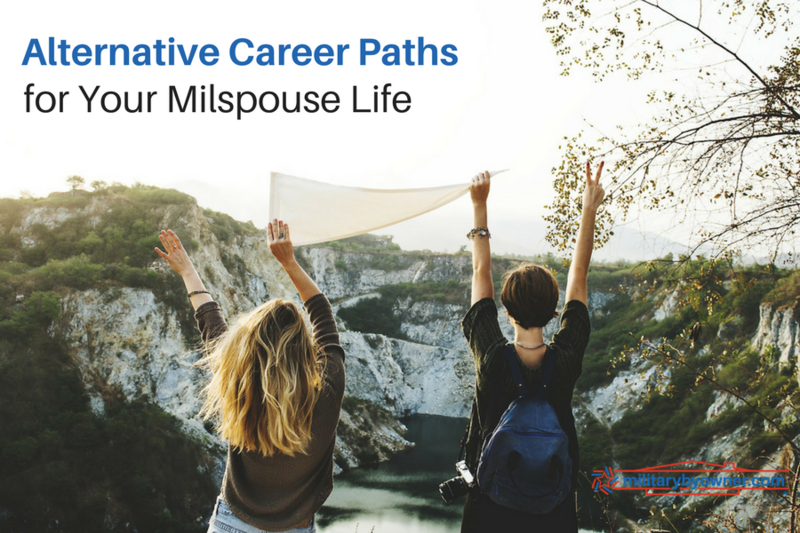 As a military spouse, having a traditional career path can seem like a Sisyphean task; but maybe it means we need to shift the paradigm on what we consider to be successful—and the way in which we pursue it. Here’s the good news: Military spouses are gritty by nature. We have the ability to adapt in ways our civilian peers probably can’t even fathom! We get creative and advocate for ourselves nonstop in many arenas—and employment is a big one. Below are some unconventional tips on how to invent (and re-invent) career paths that work for you and your crazy, beautiful, constantly changing military lifestyle! 1) Pitch for a virtual transition. In a job you love? Awesome. Try to keep it when you PCS! Approach your current employer to see if they’re receptive to transitioning you into a remote position. Be prepared to present exactly how you will make it work. Maybe you could travel in once a quarter for meetings and face time with the team. Consider taking a (reasonable) pay cut to compensate for not having to commute or needing as many childcare hours. Know what technology is on your side and research tools that can help you plead your case. If your boss isn’t tech savvy — show them! Propose a test period to try it out for 30 days or so to see if it jives. 2) Don’t wait to find a ‘dream job’ posting. 3) Be willing to accept less than you’re worth, but only temporarily! You have to acknowledge that most employers will view you as a liability. Why spend the resources to train you, only to have you pack up and leave in a year or two? The reality is you’ll probably be more loyal than a civilian hire, but that’s for another article. Instead, address this challenge head on by letting the employer know that you understand they would be taking a “risk” on you, but that it will be rewarded. You can tangibly support this by accepting a-less-than-ideal salary during a trial period. That way, their investment in you is minimal until you’ve proven what you can do. I would only advise this, however, with the promise of a 30- or 60-day evaluation in which an increased salary would be discussed. 4) Don’t be afraid to self-identify as a milspouse. For a long time, I was resistant to the idea of an employer knowing that I was a military spouse. I didn’t even wear my wedding rings to interviews. I wanted to stand on my own merits and not open the door for discrimination. I’m not sure who I thought I was fooling. The truth is that you’re more than likely going to be outed as a milspouse from your resume alone. Transparency can be your friend in this situation. Address the elephant in the room and explain all the ways in which your experience as a military spouse makes you an asset, not a liability. Frame yourself in the correct light! Acknowledge all of the misconceptions that would give an employer pause, then allay their fears with informative and proactive solutions. Will you call out sick every time your spouse is in the field? No. I interview sitters/nannies within the first week of a PCS to ensure that I always have coverage. When your spouse deploys, will you be preoccupied with worry? Wouldn’t you? Of course I will worry, but this is our life. This is what we do. I don’t let it affect my work. But what if you get orders to relocate in a year, and I’ve spent all this time/money training you? We may leave. And someone else you hire may leave as well. For now, we are here and I will give you 100 percent while we’re here. Also, I’m open to contract or virtual positions when we do PCS, and I hope to reopen that conversation with you if/when the time comes. If you don’t find an open position in a field you love or a receptive employer, this is when you stretch that creative muscle and branch out! Maybe a company is hiring for a position that you’re overqualified for or have no experience in. If you’re even the least bit interested in it, why not try it out? If your resume looks anything like mine, you’ve demonstrated your ability to pick up new skill sets and for all the reasons laid out above you’ll prove that you’re able to excel at many things. Take opportunities as they present themselves, even if it's not your first choice. Who knows? Maybe you’ll discover a new passion or something you’re insanely good at! You’ll at least have the chance to add a new skill to that chameleon resume of yours. You can also get your foot in the door of an organization that’ll allow you to grow into another role. Stay open and communicate your goals. My “career” has been an adventure thus far, but I love the challenge. You have to be willing to take as many risks as you’re asking of your potential employers, and a lot of times you’ll be better for it! I’ve taken entry-level positions, and almost without fail get promoted within the first few months. I’ve convinced employers to create positions for me and pay me when they see a difference in their profits (that’s happened twice). Keep an open mind and try to appreciate the position an employer is in— then break down all their excuses. Because you are amazing, and can prove it! MILLIE is an online community and digital marketplace that connects members of the military and their families with specialized knowledge and trusted resource providers to remove the stress and anxiety of PCSing. Check out MILLIE’s Installation and Neighborhood Guides, our network of Veteran and military spouse Realtors, and Scout, our on-demand task service composed of military spouses. Find out more at www.gomillie.comand don’t forget to find us on Facebook.